Phenom II is AMD's family of 45 nm multi-core processors and is the successor to the original Phenom. The processor has about 758 million transistors, up from the about 450 million of the original Phenom. 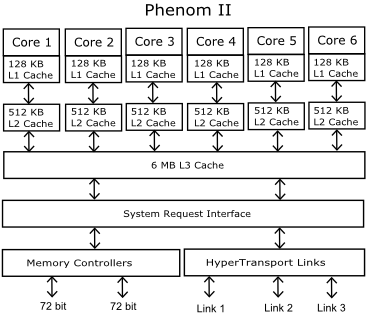 In the Phenom II, the shared L3 cache increased from 2MB to 6MB. The chip has an integrated, dual-channel memory controller that supports DDR3 RAM, and 4000MHz HyperTransport interface to the rest of the system. The Phenom II features Dual Dynamic Power Management, which allows finer power-management to reduce processor energy consumption. It also uses AMD CoolCore technology to reduce energy consumption by turning off unused parts of the processor, helping reduce system power. The Phenom II will work in AM2 and AM2+ socketed motherboards, making it an easy upgrade, as long as the motherboard's BIOS will allow it. Phenom II Black Edition processors are unlocked to allow gamers and PC hackers to overclock them to increase system performance.